Have you ever wondered where it all started? Bachaqueo, I mean – standing in line waiting to purchase price-controlled products in order to resell them in the black market. As I learned on my recent trip to Maracaibo, local lore has it that after gasoline smuggling had become a common reality in this border state, bachaqueo was born in a supermarket in the northern part of Maracaibo at the end of Fuerzas Armadas Avenue, now known as Supermercado Bicentenario Norte. The legend goes that local Guajiro indians, whose ancestral lands straddle the Venezuela-Colombia border, realized they could buy whatever they wanted and resell it in the “sister republic” for a lot more money. Price controls and the porous border made a perfect environment for the task at hand. So on my trip I decided to visit the spiritual home of bachaqueo. We arrived close to midday. There wasn’t a single cloud in the sky, the sun was picante, and the temperature was nearly 42 ºC. We parked close to the entrance and the chaos was already pretty obvious. A young man told us that some chicken had arrived, but only for 70 people. We walked around for a couple of minutes but couldn’t find the end of the line of close to 50 people. We asked an old lady and she said we had to “go outside to get in line”. We turned around and there were what seemed to be 250 people waiting outside the gated parking lot. Another lady told us it was actually three lines: one for old people, one for people with any type of disabilities, and one for “the young ones”. Apparently, the first person to get in line each day starts a rather rustic list by hand and you sign it as you arrive. Then, when the Supermarket opens, the National Guard on duty fetches the list and starts calling in groups of 10 to 20 people. When you are called, you have to hand in your ID card – but this is just to get you inside the parking lot. Then, you wait until your ID number is called, the National Guard gives the ID back to you and you can go inside the supermarket. Trust me… it sounds way more organized than it really is. People spend the night outside the Supermarket to secure a good spot in line. Let’s not forget, many regional governments, including Zulia’s governorship, outlawed these pernoctas back in January. Some sell their spots in these long lines. But you must be careful with swindlers that sell their non-existent spots. I assumed many ID cards had gotten lost in the mist of this chaos. I asked a couple of people and they didn’t seem to care much about their ID Cards. They just wanted to get in and buy their food. Most of the people we saw seemed like regular everyday consumers, not many bachaqueros. I assumed they had finished their “activities” early that morning; or maybe now they probably work with higher levels of the distribution chain. It took something like 7 minutes to understand the logistics of the place and on minute number 8 we heard some screaming and then some more. 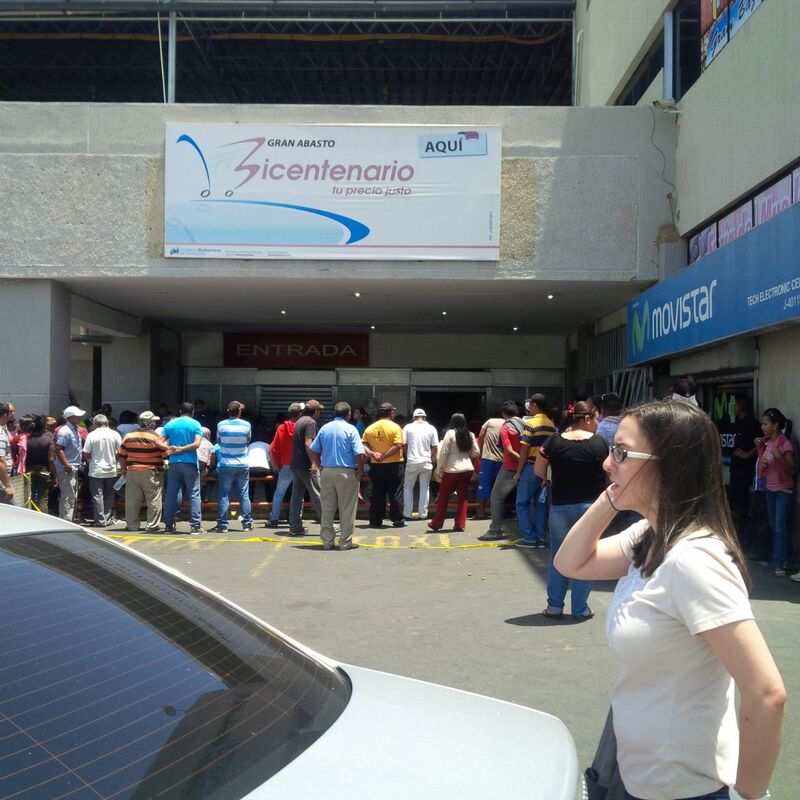 First, people screamed to pressure a guy with a red polo shirt with the Bicentenario logo to let an old lady in. Then, 5 women followed the old lady and everyone screamed so that the same guy would stop them. I looked away from the entrance to get a good view of the line outside when I heard some more screaming and a lady said that apparently a National Guard slapped someone. A couple of seconds later, the entrance santa maría (the metal siding on the front door) came down. At this point I knew I wouldn’t get in. We just stood there, under the scorching sun. It was really hard to imagine how many zulianos had to go through this every week to be able to feed their families. We then heard even more screaming, many ran to the gate and we heard a National Guard saying: “how can a dead person be in line?” Someone probably handed in the ID card of a deceased person. The chaos of the main entrance was now dispersing. But the people waiting outside the parking lot weren’t moving at all. They wanted and probably needed to get in. As we drove off we noticed the catch of the day: Harina Pan, powder laundry detergent and chicken. After the post was done I still wondered: how does Supermercado Bicentenario Norte look on the inside?